Erndales N More: A BLOCK A WEEK! One of the things I have always wanted to do is quilt. I have made the odd block (odd being the operative word here) and have completed small quilting projects like my mug rugs, but I have never actually made a real quilt. Well I did make 2 blue jean quilts for my brother and nephew a couple of years ago for Christmas, which were just cutting jeans apart and resewing them into the form of a blanket - but I don't really consider that real quilting. 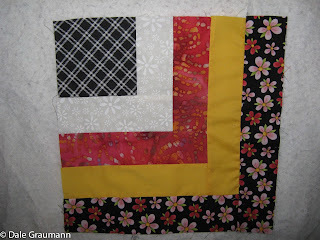 I want to really quilt - you know cut pieces sew them together in a pattern, then put all those patterns together to make a full size quilt. I have my Mother's old Elna sewing machine all warmed up from rug mug making, so what better time than now! My cousin Debbie gave me a challenge - and scary as it is - I took it! 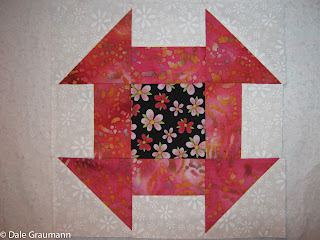 This is a 25 block quilt challenge that started on the Winter Solstice and will end on the Summer Solstice. Every Wednesday, Pat ( the host of the challenge) emails us the pattern and directions for 1 block. These are scrappy blocks so you can use whatever colours you want or have on hand. Quilters are encouraged to share pictures on Pat's site of completed blocks as we go along. Some of the quilters are doing such amazing things with their blocks... myself.... well for a beginner quilter, I guess I am doing okay. My biggest challenge is my lack of enough co-ordinating fabrics to actually be able to complete the whole quilt - and more so the inability to rush to the fabric store to buy more material! I am not happy with tide pool - but will leave it for now. 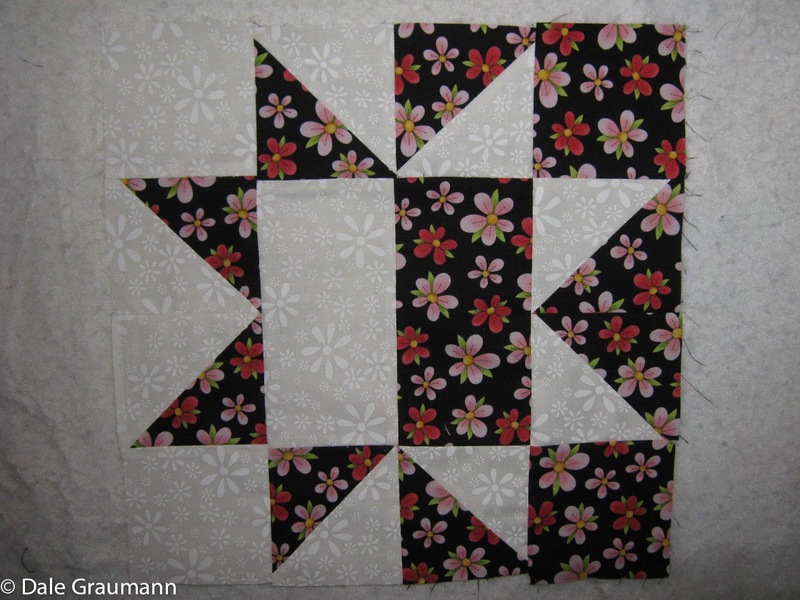 I am running out of the black daisy fabric, but I am not sure the yellow is the way to go - even though the daisies have yellow centers. If you would like to join this challenge, just go to the link I have shared and sign up to get the blocks emailed to you. 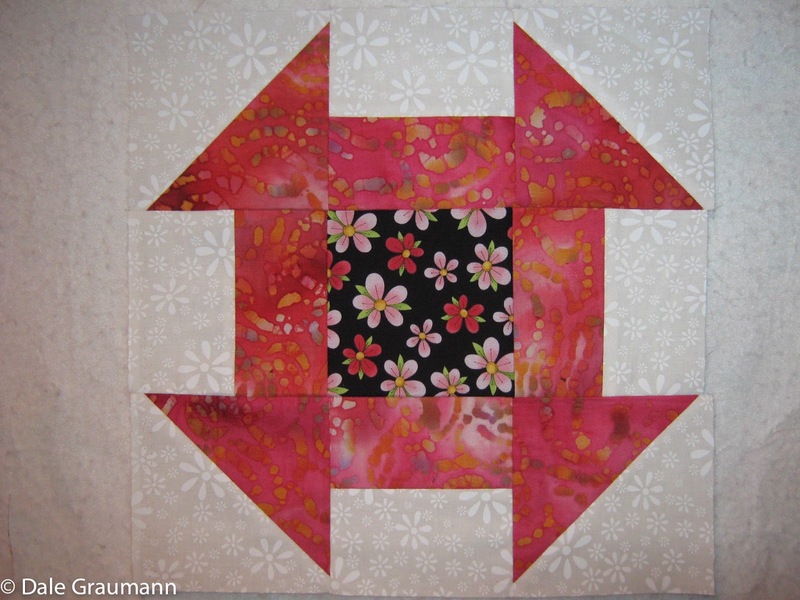 Pat has several more free quilt Block patterns on her site as well - so you can choose something different or even work on more than one quilt. I am throwing out a Challenge to You.... If you have a sewing machine - dust it off, pick up some fabric and make a quilt. You can give it as a gift - donate it to charity or a shelter, or proudly display it on your own bed when it is finished. What a perfect project to while away the long days of winter... one week at a time!